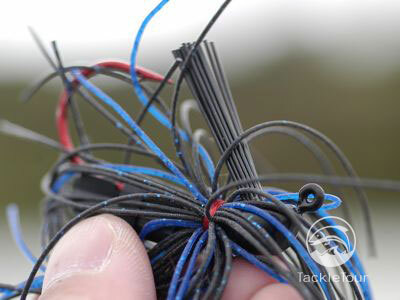 Introduction: If it weren't for the big baits, this could very well be the year of the jig here at TackleTour. You would not believe the number of brands we have in on this seemingly simple, yet effective little lure. Today, we bring to you our thoughts on a jig I've been looking forward to try for quite some time: the Tru-Tungsten Jason Quinn Jig. Impressions: The reason I've been looking forward to trying this product? The head is made of tungsten instead of lead. In a move that has seemed to lose some momentum this past year or two, Tru-Tungsten offers what seems to be a no brainer alternative to the typical lead headed jig. Of all the jig alternatives on the market today, very few are made of alternative materials. But just how does this green conscience jig fish? Let's find out. The Field Tests: I've actually been throwing this jig on and off for the better part of the past year now and on a few different setups. Most notable of these rigs are my Daiwa Steez 7' Compile-X rod matched with a limited run 2004 Daiwa TDZ TypeR+ 103ML and my Evergreen Dengeki matched with a similarly limited production reel in the Abu AE74 SX1601C Morrum. I used 14lb Sunline Shooter FC on both combos. The Head: Tungsten has the benefit of being actually denser than lead so similarly weighted products will have a smaller profile in tungsten than they would otherwise have with a lead product. Interestingly enough, though I am sure the differences are there, it's hard to make an apples to apples comparison with jigs since most every company has a little different take on head design. As such, the size of the Tru-Tungsten jigheads are not noticeably smaller than what we'd expect. ... hand tied for extra flare and security. 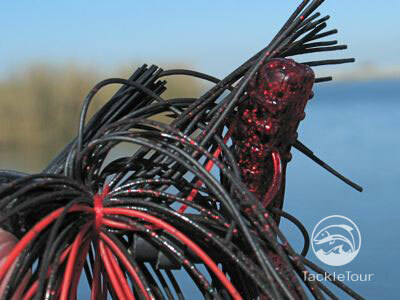 The Line Tie: The point of connection between your line and the jig, referred to as the bait's line tie, is a very important factor with most jig fisherman. For the jig connoisseur, the position of the line tie will not only determine for what application a jig is best suited but also what type of cover you can effectively fish said jig within. 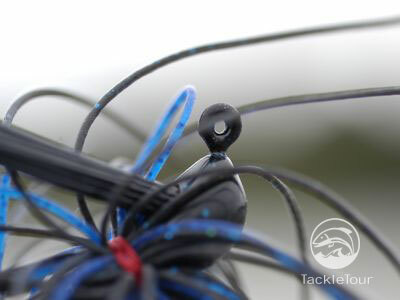 The rather pronounced line tie of our Tru-Tungsten Jig. 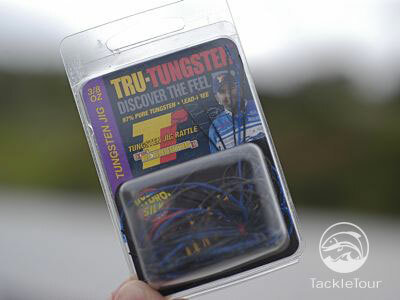 The Tru-Tungsten jig's line tie is rather pronounced and positioned very forward of the bait right at the tip of the jig's head. This would suggest the bait is intended more for grass than rocks and perhaps even meant to be fished as swimming jig. For rocky situations, a jig whose line tie is more recessed and further back on the head is usually more effective. Trailers are best attached stabbed like a pork trailer rather than threaded. 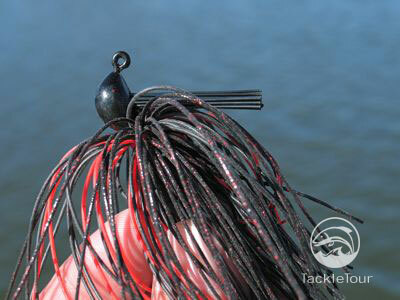 The Skirt: The skirt on the Tru-Tungsten jig is tied onto the head rather than being fastened with a rubber band. This is good as skirts fastened in this fashion not only have better durability for staying on the jig, but also flare out better because they are held on so tight. 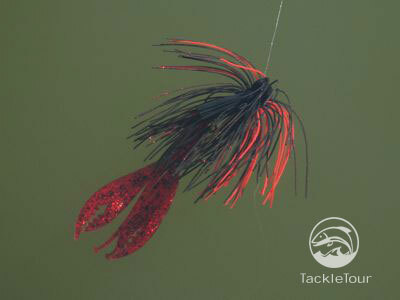 Such is the case with this jig as you can see from the photos, the Tru-Tungsten jig's skirt flares out nicely. The skirt flares out quite nicely.